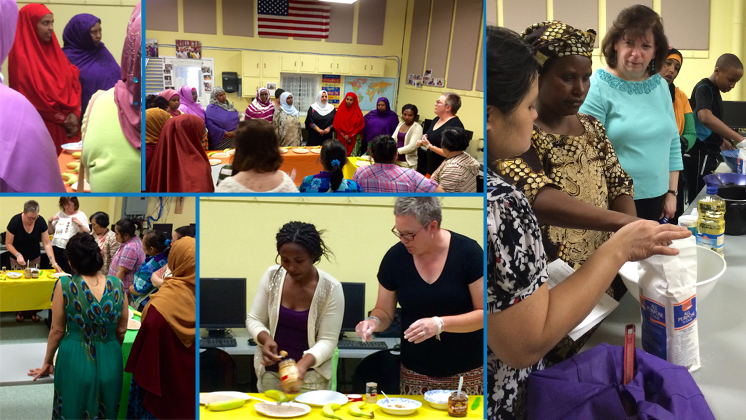 On Monday Evenings, staff members of Child Care Solutions gather with refugees who have settled in Central NY and are fulfilling their American Dream of starting their own child care businesses. Staff members teach everything from nutrition, art, and music to health and safety and regulations. We are there to teach, but inevitably we become the students. The women in our sessions are inspirational, courageous and quite frankly awe-inspiring. We are humbled by their perseverance, thirst for knowledge and gratitude. United we create a beautiful, colorful community. If you would like to support programs like this so all children have access to high quality child care please consider donating to Child Care Solutions. Child care providers have the knowledge, skills and resources they need to support children’s early learning and healthy development. Easily make a donation below or contact Lori Schakow for more information. “Donations to our general fund allow us to continue offering critical programs and services to the parents and child care providers of Central New York. Donations support scholarships awarded to child care providers to defray the cost of training that is critical to enhancing their knowledge and skills. Donations support the professional development of child care providers and our staff so we can continue to offer outstanding programs and services to our customers. Support high quality child care and education for all children in CNY.